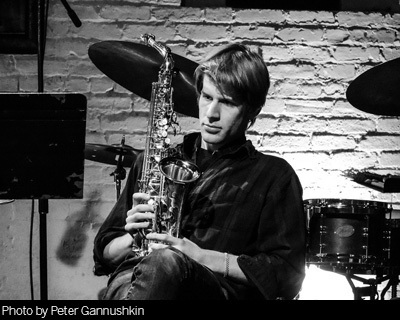 Chris Pitsiokos is an alto saxophonist and composer based in Brooklyn, NY. Aesthetically, his work combines the lyricism of jazz and the intensity of extreme rock forms and noise with the attention to detail and abstraction of contemporary classical music. Known for expanding the vocabulary of the saxophone through extended range, circular breathing, nuanced articulation, and other extended techniques, his recent work also commands considerable cathartic, emotive, and lyrical power. His compositions often function as a platform for performers to express a unified aesthetic vision without subjugating their individual voices as musicians in their own right. In this way his work contrasts with more traditional modes of composition in which the composer or band leader is the sole, or primary arbiter, of a singular vision. Pitsiokos has worked with Weasel Walter, Tyshawn Sorey, Peter Evans, Joe Morris, Philip White, Guerilla Toss, C Spencer Yeh, Nate Wooley, Brandon Seabrook, Lydia Lunch, Paul Lytton, Miya Masaoka, Mick Barr, and many more. He has appeared at major festivals and toured throughout Europe, the United States and Japan as a solo artist, with his own bands, and as a side man. A prolific artist, Pitsiokos is the leader or co-leader of ten commercial recordings on record labels Clean Feed, Astral Spirits, UgExplode, One Hand, Carrier, New Atlantis, and his own imprint, Eleatic. He was a contributor to Arcana VIII, a book of essays edited by John Zorn, and was a resident at Zorn’s club the Stone in November 2016. In addition to performing and composing music, Pitsiokos was a longtime DJ at radio station WKCR-FM and has been producing concerts in Brooklyn and Manhattan for five years.